The first Smokey Bear poster shows a brown-coated bear. He is wearing jeans. He's peering shyly up from under a campaign hat as he pours a bucket of water over a campfire. 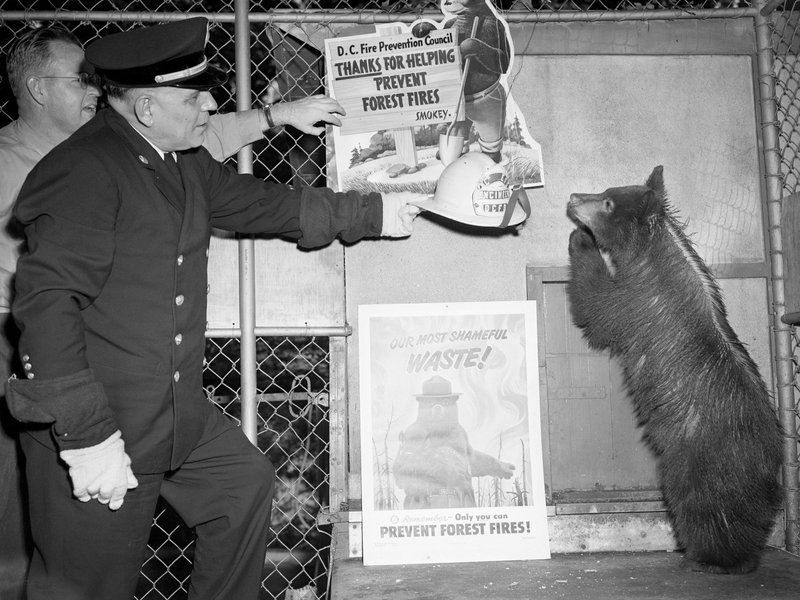 "SMOKEY SAYS," the poster reads, "Care will prevent 9 out of 10 forest fires!" Albert Staehle, the illustrator, might have chosen a bear (over the suggested raccoon) because he wanted Smokey to look like the father of the forest, as his wife later recalled. But many will forever associate the cartoon with a real bear cub. Its paws and belly were singed in a 1950 spring wildfire. In a biography - "Smokey Bear: The Cub Who Left His Pawprints on History" - the "real" Smokey is getting a proper tribute, reports the Sun-Sentinel newspaper. It is in South Florida. The book's author is Karen Signell. She met Smokey when he was a cub. The bear was living at the National Zoo in Washington. "The Bell family was constantly taking in wild animals, so Don Bell didn't think much of the 'cute little guy' who slept in a rabbit cage on the back porch. But the story of the rescued cub would become a national phenomenon. Smokey's arrival at the capital airport drew hundreds of reporters, photographers and onlookers, and he appeared in newspapers across the country." Signell visited the cub not long after he reached the zoo. She writes Smokey's story from his perspective. Don Bell told the Sun-Sentinel he feared it might be "hokey" but that "(a)fter she got it all put together and everything and finished it up, I read it and I think she did a pretty good job." "I thought of the book as a fictionalized historical biography. And, from the beginning, I wrote it mainly for adults. But also youngsters. I chose to write the novel from the bear's point of view (but in the third person), in my respect for the wild animal's intelligence and my empathy for his emotions. It was not easy to write this way. I had to imagine how he smelled his world, what sounds he made ... But I was greatly helped by naturalists' books with vivid descriptions of cubs and bears they knew well." Other famous National Zoo residents during Smokey's life also make appearances in the novel. Expect to hear about the Ling-Ling and Hsing-Hsing. They are the two giant pandas gifted from China after President Richard Nixon's 1972 visit and space-chimp Ham's retirement. 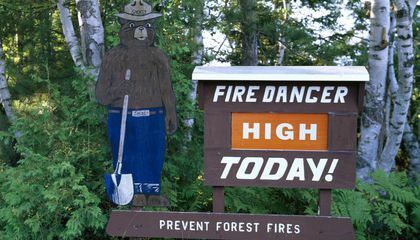 How does Smokey help prevent forest fires? Smokey the bear helps prevent forest fires by being an advertisement that little children love as well as everyone else. He is posted up around forest with signs. He lets them know if it is a high or low chance of a fire. if so maybe its not a good day to go camping etc. I agree with you that he is a character that little children and other people look up too, and am so glad that someone else agrees with me. I like that you also mentioned that he lets people know if it is a good day to go camping. I like what your saying, but hes probably not going to determine if you camp there because they've probably waited a long time to go there so a sign won't stop them. Yes! I agree and I disagree with you because, the reason why agree with you is becuase a sign doesn't really tell you not to go camping. The reason why I disagree with you is because when you go camping you sometimes lit a fire. *I agree with you because he`s not a meteorologist. I agree, Smokey the bear is very positive and helps kids learn about he wilderness and make it very fun with safety. i agree, i would also like to add that he also inspires children because of his inspiring story. I agree he also doesn't just inspire the children he has the eyes of many adults to. I think since Smokey the bear has such an inspiring story he has caught the eyes of many people and gotten people to be more aware of the forest fires. i would like to add that he is a warning to people that if they are to careless there will be another smokey. wahhhhh!